(Phys.org) —Black holes—massive objects in space with gravitational forces so strong that not even light can escape them—come in a variety of sizes. On the smaller end of the scale are the stellar-mass black holes that are formed during the deaths of stars. At the larger end are supermassive black holes, which contain up to one billion times the mass of our sun. Over billions of years, small black holes can slowly grow into the supermassive variety by taking on mass from their surroundings and also by merging with other black holes. But this slow process can't explain the problem of supermassive black holes existing in the early universe—such black holes would have formed less than one billion years after the Big Bang. Certain models of supermassive black hole growth invoke the presence of "seed" black holes that result from the deaths of very early stars. These seed black holes gain mass and increase in size by picking up the materials around them—a process called accretion—or by merging with other black holes. 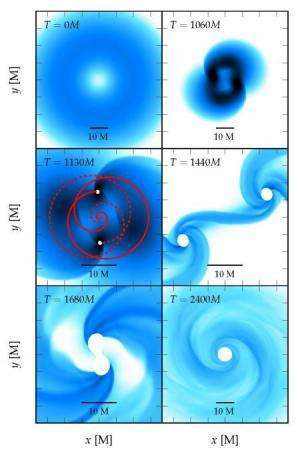 "But in these previous models, there was simply not enough time for any black hole to reach a supermassive scale so soon after the birth of the universe," says Christian Reisswig, NASA Einstein Postdoctoral Fellow in Astrophysics at Caltech and the lead author of the study. "The growth of black holes to supermassive scales in the young universe seems only possible if the 'seed' mass of the collapsing object was already sufficiently large," he says. To investigate the origins of young supermassive black holes, Reisswig, in collaboration with Christian Ott, assistant professor of theoretical astrophysics, and their colleagues turned to a model involving supermassive stars. These giant, rather exotic stars are hypothesized to have existed for just a brief time in the early universe. Unlike ordinary stars, supermassive stars are stabilized against gravity mostly by their own photon radiation. In a very massive star, photon radiation—the outward flux of photons that is generated due to the star's very high interior temperatures—pushes gas from the star outward in opposition to the gravitational force that pulls the gas back in. When the two forces are equal, this balance is called hydrostatic equilibrium. These fragments would orbit the center of the star and become increasingly dense as they picked up matter during the collapse; they would also increase in temperature. And then, Reisswig says, "an interesting effect kicks in." At sufficiently high temperatures, there would be enough energy available to match up electrons and their antiparticles, or positrons, into what are known as electron-positron pairs. The creation of electron-positron pairs would cause a loss of pressure, further accelerating the collapse; as a result, the two orbiting fragments would ultimately become so dense that a black hole could form at each clump. The pair of black holes might then spiral around one another before merging to become one large black hole. "This is a new finding," Reisswig says. "Nobody has ever predicted that a single collapsing star could produce a pair of black holes that then merge." Ott says that these findings will have important implications for cosmology. "The emitted gravitational-wave signal and its potential detection will inform researchers about the formation process of the first supermassive black holes in the still very young universe, and may settle some—and raise new—important questions on the history of our universe," he says. These findings were published in Physical Review Letters the week of October 11 in a paper titled "Formation and Coalescence of Cosmological Supermassive-Black-Hole Binaries in Supermassive-Star Collapse." Caltech coauthors authors on the study include Ernazar Abdikamalov, Roland Haas, Philipp Mösta. Another coauthor on the study, Erik Schnetter, is at the Perimeter Institute for Theoretical Physics in Canada. The work was funded by the National Science Foundation, NASA, the Alfred P. Sloan Foundation, and the Sherman Fairchild Foundation. Meh. I clicked on this article just to see how long it would take for it to mention a model, and in the off chance that this was based on some actual observation. Not that I don't understand that his is how progress is made, but it's become annoyingly predictable when something is based on somebody's possibly far-flung model and it suddenly becomes headline news within it's circle of influence. Can anybody suggest a site where they don't attempt to sensationalize every single little thing they can just for ad revenue? Furthermore, with regard to this particular finding, it doesn't even advance anything to any major degree. Ok, so LIGO and other future space-based gravitational wave detectors come online and begin detecting these events. Without this research, at that point, the scientific community begins trying to explain them, and by that time, some comparatively "lowly" post-doc is able to create the exact same model in a weekend, using a much higher-level language, using much faster computers, and get the same result with much much less work. Edit - I'd like to make it clear that I do understand that often times these types of modeling discoveries inform the design of future detectors. This one, however, will not. This computer modeling work demonstrates the feasibility of something previously unrealized. Now that we know it is possible for two black holes to form from a single collapsing star, we must consider the possibility that the two might never merge under certain circumstances. Thus it compels us to take a new look at all binary black hole systems. That's one major real reason for this work but until you build the model and run it, you don't know whether it will throw up something vital or just confirm previous assumptions. The work costs so publishing even if there is nothing of interest avoids others wasting their time following the same path. You are right about the publication motive being ad based though, but without that we wouldn't get the good stuff either. Just pick the wheat and ignore the chaff. Perhaps 3 or more BH would form and some would be kicked out like sub-stellar powerballs.